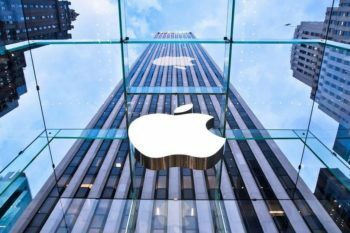 The concept of money and money itself have been around for centuries, but they haven’t always taken the form they take today. If right now a bill of any amount and any currency is nothing more than a simple piece of paper without any intrinsic value, we can’t say the same about the money that have circulated in the past. 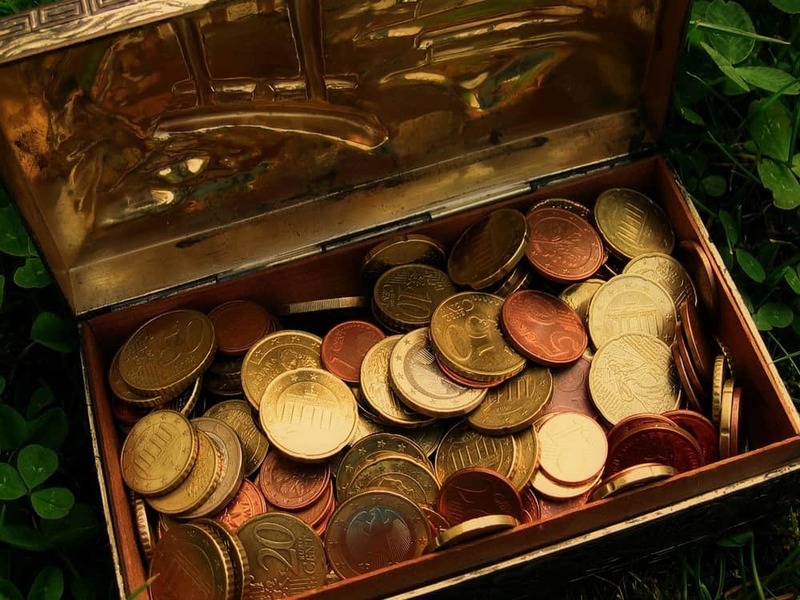 Before the paper printed money there were only coins. 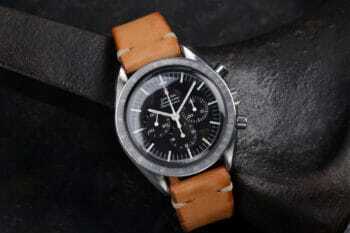 Initially they were made out of precious metals, but that changed with time and more common metals were used instead. Due to various reasons such as rarity, historical happenstance or errors in minting or printing, some coins have gained a lot more in value than they had initially. These coins are usually highly sought after by collectors from all over the world, thus increasing their value even more. What for most means nothing, for some coin and banknote enthusiasts it’s worth big money. 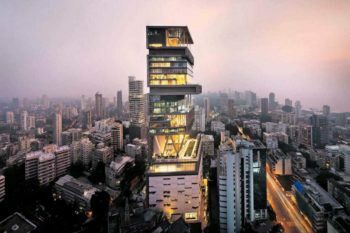 And when we say big, we mean really big money. 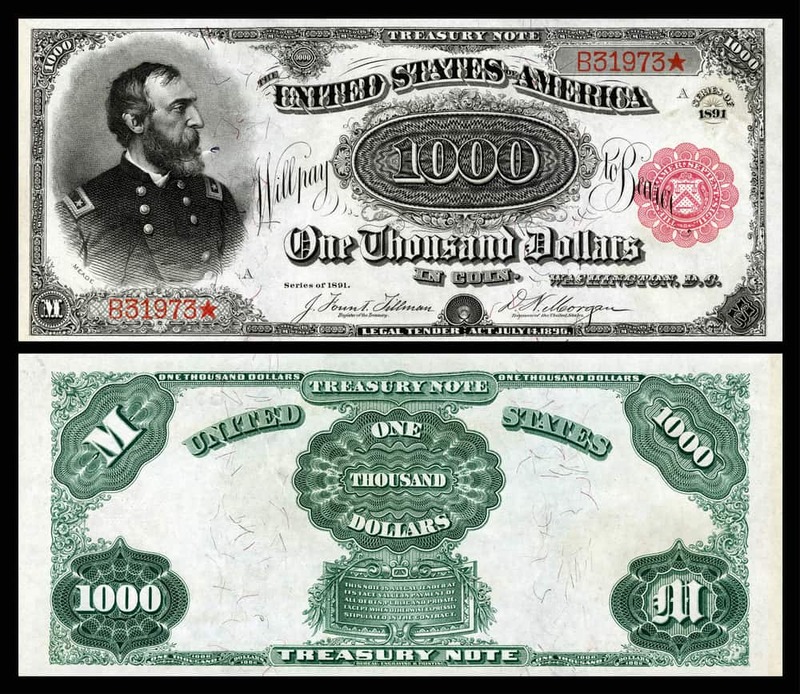 Yes, I know, it’s not exactly a coin, but this $1,000 bill with its face depicting Major General George Gordon Meade was printed back in 1891 and made history. Due to all the hands it has passed through during history this particular banknote has become an item many collectors want it. Also, the age and its rarity add a lot more to its historical value. The banknote, having the US Red Seal on it, has been sold in April 2013 for a whooping $2.5 million, making it the most expensive banknote ever sold. 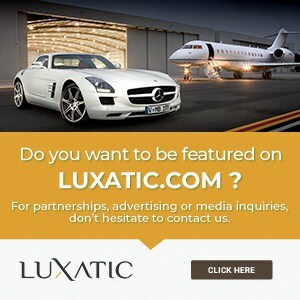 We just have to it include it in this list. Moving on to the real coins. The story of the 1913 Liberty Head nickel is that it was pressed without the approval of the U.S. Mint, after switching the design from the lady Liberty to the profile of a Native American. 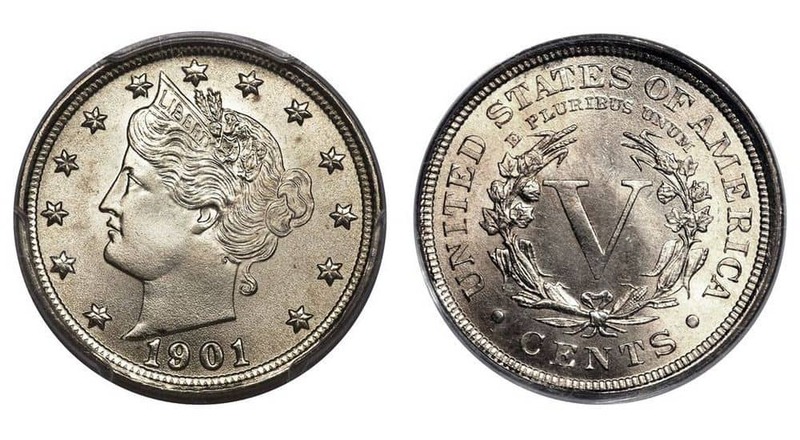 Fortunately for the collectors, five of these coins made their way to the public, a number so small that made their value soar so high, that the most expensive of them was sold for no less than $3.7 million.Some even believe that if one of them could be found in mint condition, its value would reach at least $20 million. Though it says 1804, this silver dollar class I wasn’t actually minted in 1804. That happened only 30 years later, when it was mixed up with other dollar coins which were minted as gifts for Asian rulers who were on trade envoy visits. The coin got $3.8 million at a Heritage Auctions auction in May 2008. This one is almost the same with the one above, from the same set of only 15 coints, but it was sold by another auction house, Bowers and Marena, for an unbelievable $4.1 million. It’s even more interesting that when this particular coin was pressed, its value was only one dollar. Quite a rise in value over two centuries. This one is a weird one, but nonetheless extremely valuable, and exactly for its weirdness. 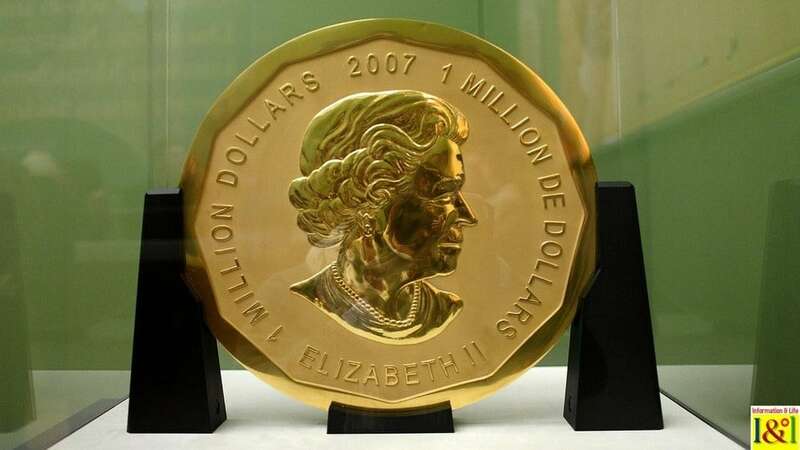 It’s a 100 kg coin, minted in 2007 by the Royal Canadian Mint and made from pure gold (almost) with a face value of $1 million. 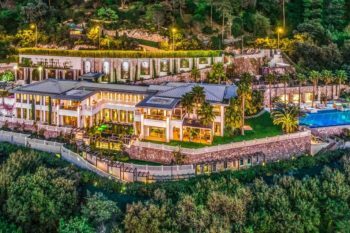 Its value increased dramatically when it was auctioned, hitting the mark of $4.1 million. 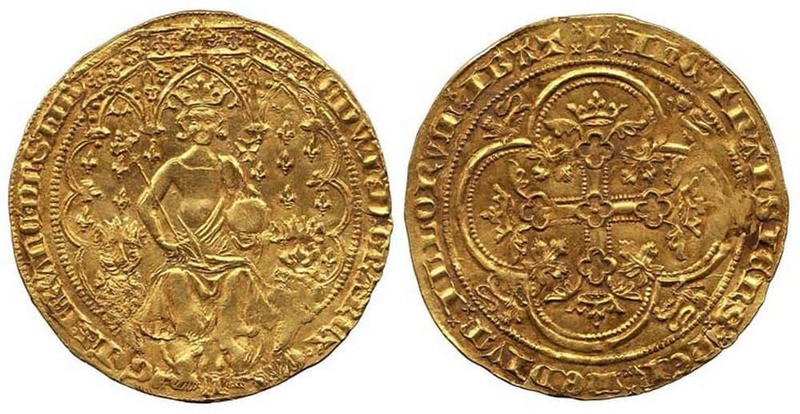 Minted back in 1343 the Edward III florin has always been one of the world’s most valuable coins. It’s extremely rare, with only three of them having survived the centuries. 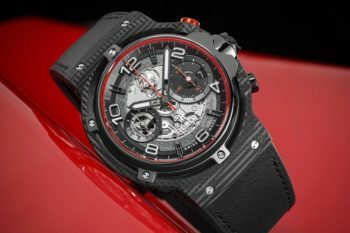 And this precious example was sold for a stunning $6.8 million. Back in 1787, the talented goldsmith Ephraim Brasher petitioned the New York State to mint a new set of coins from copper. 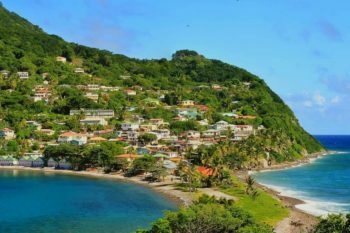 The response he received from the state legislature was that they didn’t want copper coins and didn’t need the man’s work. He ignored the negative answer and went on to mint the coins anyway, most of them in bronze and very few of them in 22 carat gold. 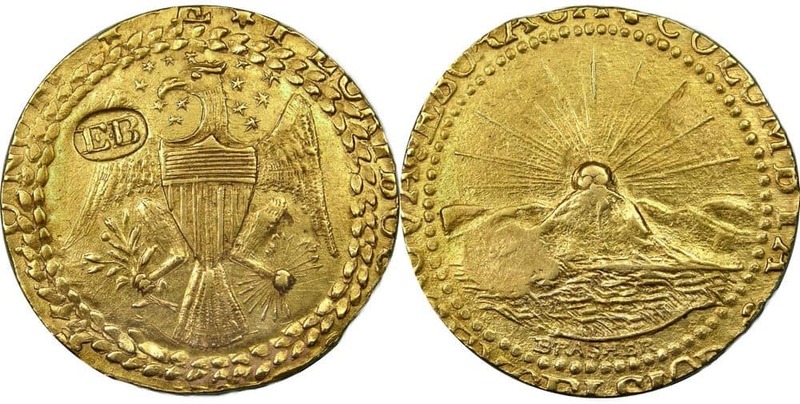 One of these, a doubloon, fell in the hands of a Wall Street investment firm who bought it for $7.4 million. 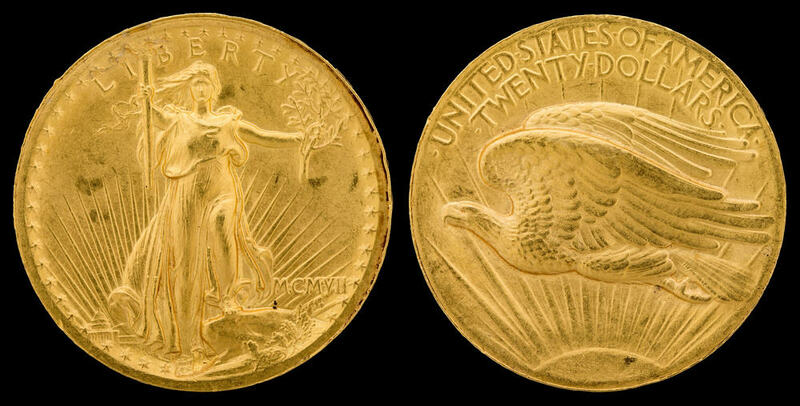 The 1907 Saint-Gaudens double eagle, was produced by Augustus Saint-Gaudens and had a design so difficult to mint by the U.S. Mint in commercial quantities, so they modified it. But Charles Barber, the Mint’s chief engraver at the time, decided to not remove anything from the design but to strike the words ‘In God We Trust’ from the coin. The Congress wasn’t very happy about it, but the coin went through production. 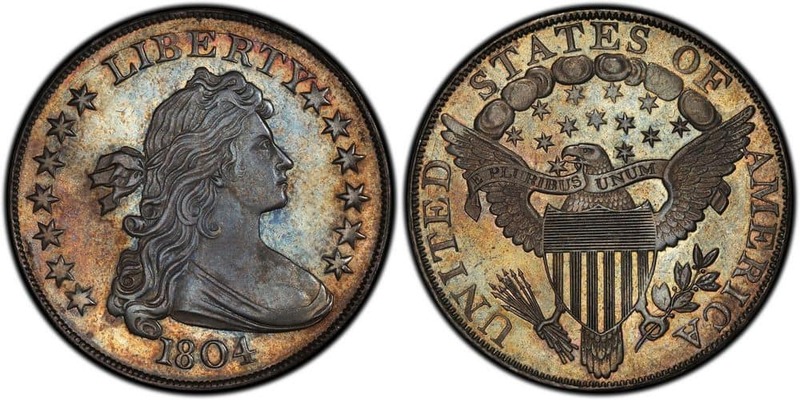 Today though, this coin is incredibly rare and its price rises to at least $7.6 million. 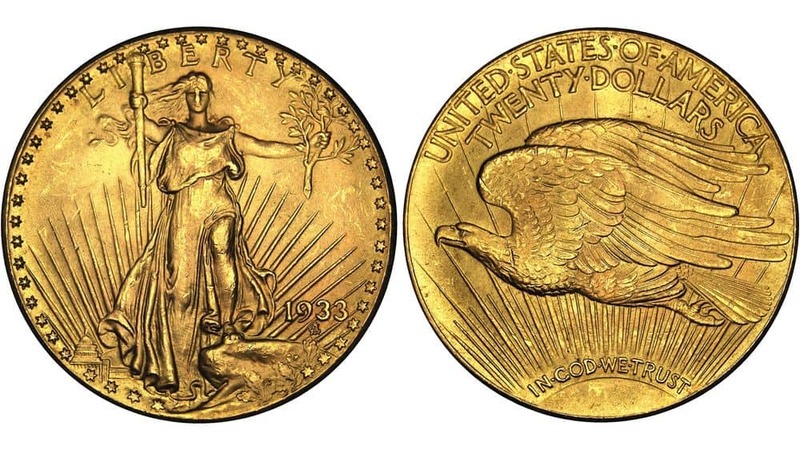 The 1933 Double eagle was a coin that was pressed but never released for the public. What’s more, Franklin D. Roosevelt even prohibited people from holding gold in 1933 in an attempt to put the banking crisis that was ravaging the U.S. at the time to an end. The circumstance made that around twenty of these coins somehow managed to get through and today they value a lot more than they were initially. One of them was sold for $7.6 million. 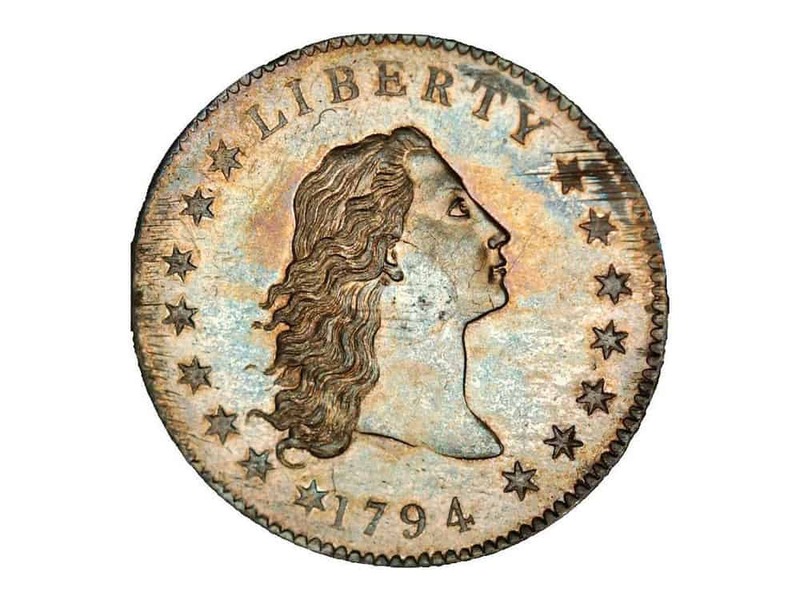 The 1794/5 Flowing hair silver/copper dollar was the first dollar coin ever to be issued by the U.S. Federal Government. The coin, made from 10 percent copper and 90 percent silver, was minted in 1794 and 1795 by the newly founded U.S. Federal Mint at the time. 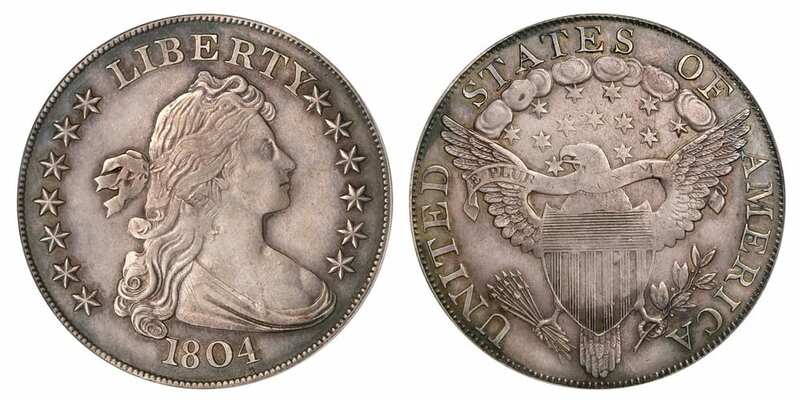 With its famous bust of Liberty and its flowing tresses make the coin value a huge amount of money nowadays, $10 million to be more precise, sold in January 2013. The 1794 dollar is a historical memento and its value will probably soar even more in the following decades.